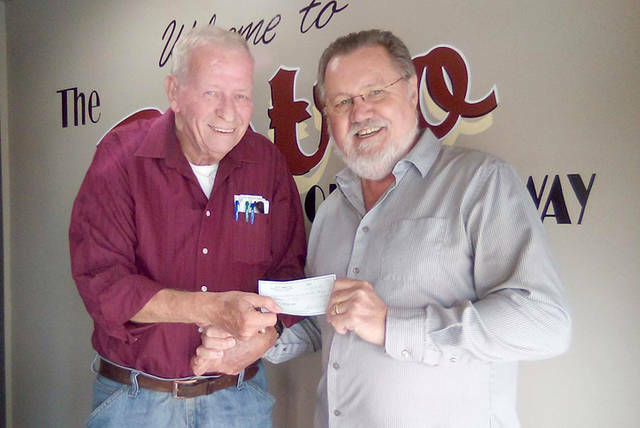 Bob Robinson (left), executive director of Empowering Darke County Youth, accepts a donation from Ted Abney, owner of Bistro Off Broadway. GREENVILLE – Ted and Diana Abney, owners of Bistro Off Broadway, have continued their support of Darke County young people with another donation to Empowering Darke County Youth for its After School and Summer Tutoring programs. The Abneys have been strong long-time supporters of the Darke County community, not only by providing a dining menu but also for their support of various community organizations and the education of Darke County’s young people. Their support of local youth has included college scholarships, local 4-H programs and, for the past two years, Empowering Darke County Youth programs. The Empowering After School Program recently passed the halfway mark in its work with Greenville students, grades kindergarten through eight, for the 2018-19 school year. Since its inception in 2016, Empowering has worked more than 13,000 hours in its After School and Summer Tutoring programs with nearly 500 students from four school districts. The organization hopes to expand both its After School and Summer Tutoring programs to at least one additional district later this year. In order to expand its reach to more students in Darke County, Empowering needs continued support from the community. It can be in the form of volunteering, provision of snacks and supplies or donations and grants. To find out more how to help, go to the Empowering Darke County Youth Facebook page or email empoweringyouth101@gmail.com.